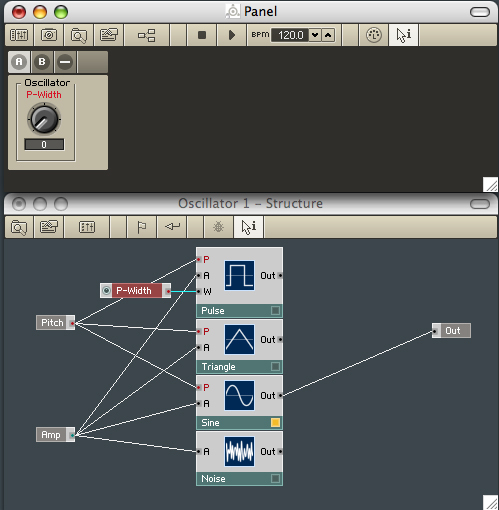 Building a Synthesiser - an introductory tutorial for Reaktor v5. In this part of the tutorial we'll add a simple sine wave oscillator and make it work. Then we'll add some more possibilities. 1. 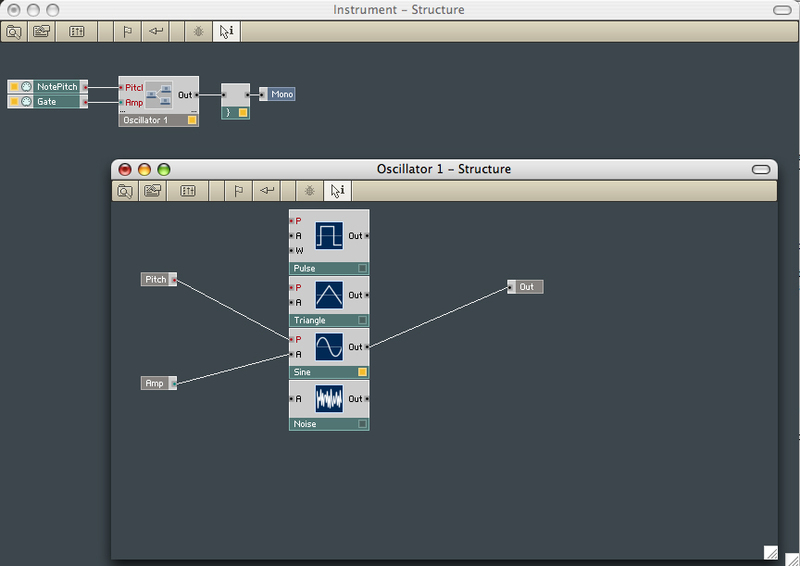 I've enlarged the Instrument structure window below, so that you can see the full list of Oscillators. 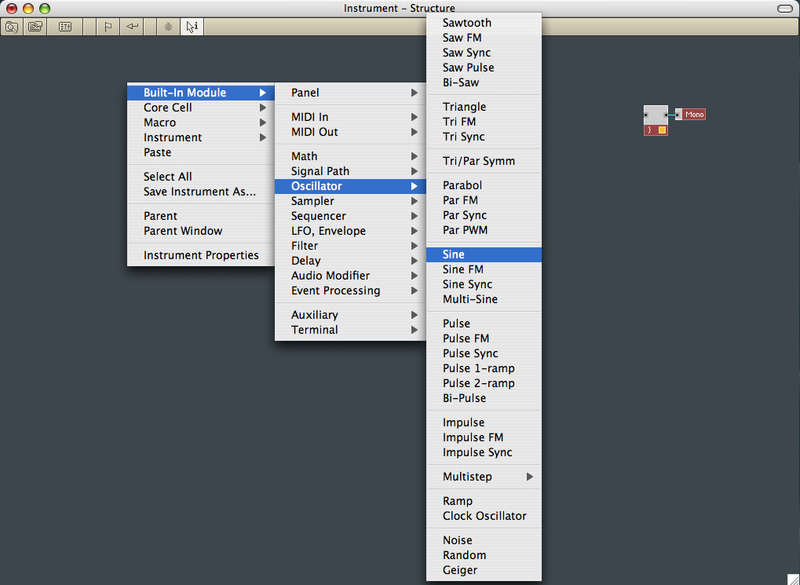 Right click anywhere in the window to get the menus and then select a Sine wave oscillator. 2. When the oscillator appears, 'wire' it into the audio collector. 3. 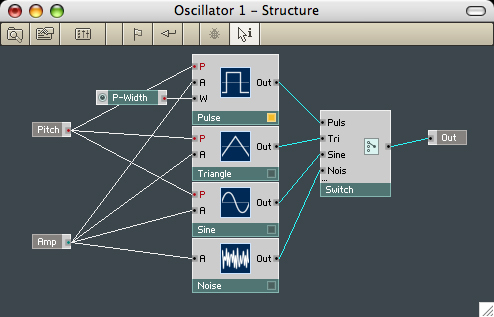 The oscillator has inputs for Pitch and Amplitude. We'll use MIDI to control it. So Right click in the Instrument Structure again and choose "Built-In Module>MIDI In>Note Pitch" for the Pitch control. 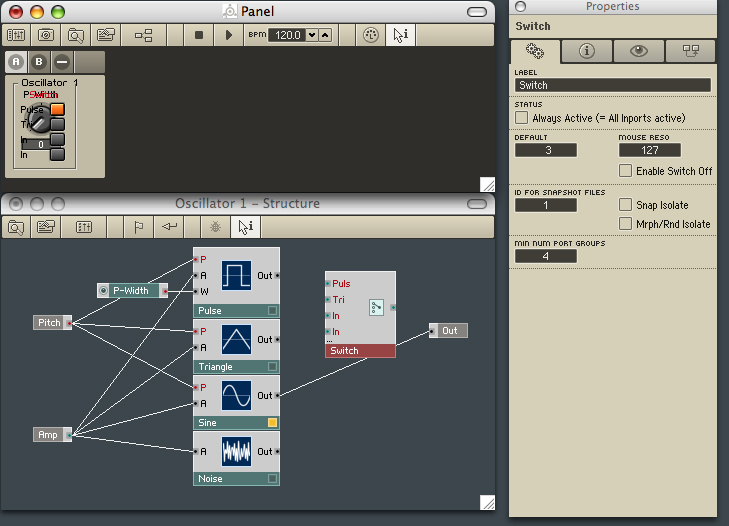 We'll need a Gate to start and stop the sound so, from the same menus choose "Built-In Module>MIDI In>Gate. When these are both wired in you should be able to use the querty keyboard to send some MIDI note on messages and make some sounds. 4. Next, we're going to make our first Macro, into which we'll put our Sine wave oscillator along with oscillators to generate Pulse, Triangle and Noise. We'll add a switch so that we can use the Symple Synth's front panel to select which wave to use. And we'll add a control for Pulse Width. 5. 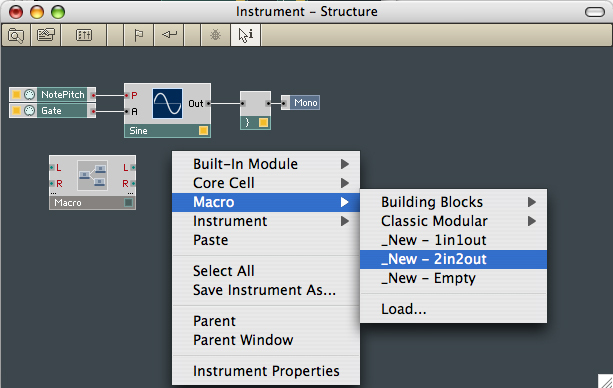 Right click the Macro and use the Properties box to rename it to "Oscillator 1". Then Right click the Macro again and open its Structure window. We'll only need one output, so delete one of the output ports and rename the other to "Out". Don't close the properties box yet; click on one of the input ports; you'll see that the properties box changes to refer to the item you've selected. 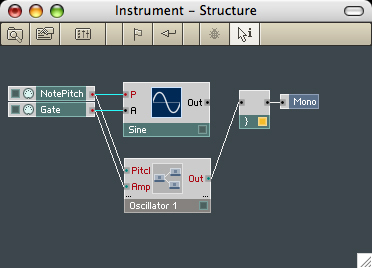 Rename the input ports to "Pitch" and "Amp" (Amplitude won't fit). 6. You may be a bit lost right now, so here's a picture of your instrument with the new Oscillator1 Macro showing its three ports (that's all its got so far). And it's not wired in yet. 8. 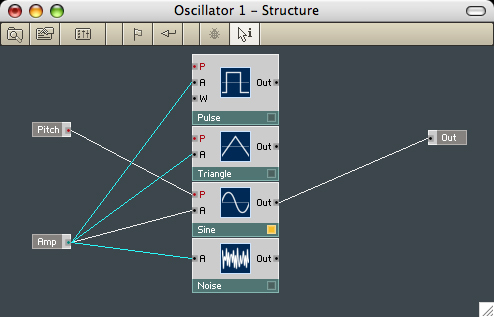 Select the Sine wave Oscillator and Edit>Cut (surely you know the shortcut) it to the clipboard. 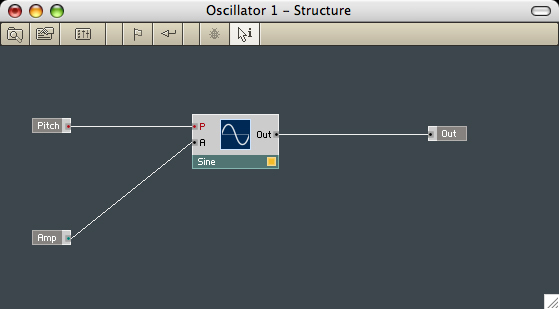 Open the Structure Window of Oscillator1 and Edit>Paste the Sine wave oscillator into Oscillator1. Complete the process by wiring the Sine wave oscillator into the Pitch and Amp inputs and the Out of the Macro. 9. The Instrument now looks like this. All of the indicator square are yellow, so it should continue to create its less than subtle sine wave. Incidentally, it won't start to sound good until we add an Amplitude Envelope. But that comes later. 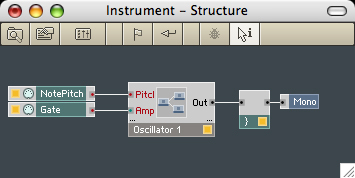 Let's make our Oscillator1 a bit more interesting. 10. 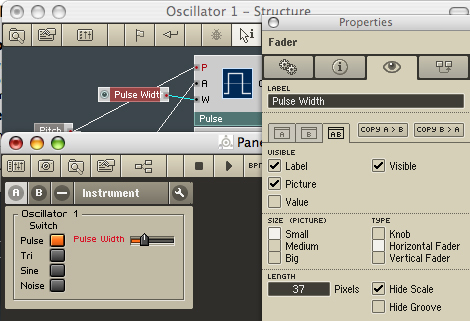 Go back to the Oscillator1 Structure and use the Built-In Module>Oscillator submenu to add Pulse, Triangle and Noise oscillators. I've included a picture of the Instrument Structure here, so that you can see where you are. 12. Wire the Pitch input into the Pulse and Triangle oscillators (the Noise oscillator doesn't respond to Pitch). 13. We'll need to control the Pulse Width of the Pulse Wave Oscillator. Right click its W input and select "Create Control". The P-Width control not only appears in the Oscillator1 Structure, but also appears in the Symple Synth front panel. Notice that if it's highlighted in the Structure Window it's also highlighted in the Panel; that's a handy feature when you need to find things. 14. We're only going to use one type of wave at a time in this oscillator, so we'll need a switch to control things from the front panel. Right click and choose Built-In Module>Panel>Switch. Right click the Switch that's created and select Properties. On the Tools tab of the Properties box (two cogs) change "MIN NUM PORT GROUPS" from 1 to 4. You can select and rename the Switch's inputs (I've changed two of them in the picture). Incidentally, look at the mess the Panel is in. We'll need to tidy that up before it gets too confusing even to see what it contains. 15. Wire the outputs from all of the oscillators to the Switch and then wire the Switch's output to Oscillator1's output port. Whichever oscillator is selected on the Switch Panel control (you can't even make that out properly, yet) will have its yellow light illuminated. 16. Unlock the Panel (Right click in the Panel's open space if the spanner tool isn't visible yet) and drag the Switch to the right so that it doesn't obscure the P-Width control. Click the spanner to lock the Panel again and test the Switch. When the Pulse oscillator is selected, you'll be able to test the Pulse Width control, too. 17. Right click on the P-Width Control in the Oscillator1 Structure Window (or the P-Width know in the Instrument Panel) and select the Eye Tab of the Properties box. Here's where we can change it from a Big Knob to a Small Horizontal Fader. Change its length from the default 91 pixels to 37 pixels, Hide Scale and deselect Value, and change the LABEL to "Pulse Width", too. Unlock the Panel and tidy up by moving the Fader next to the Pulse Switch. 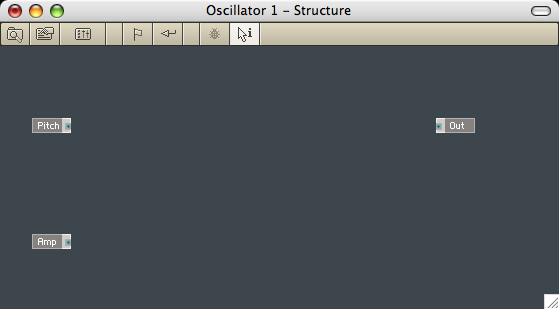 That's our Oscillator1 Macro finished. 18. We'll get a much richer range of sounds if we add another, slightly different Oscillator Macro and set up a Detune Control. That's easier to achieve than you might think. Right click on the Oscillator1 Macro and Duplicate it. 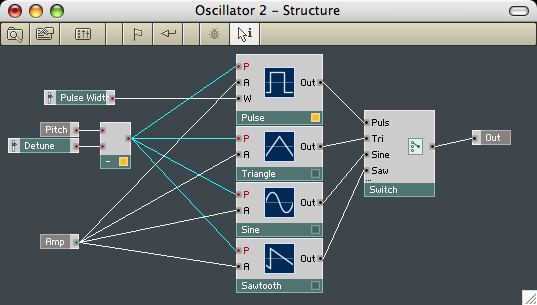 Rename the new Oscillator "Oscillator2", open its Structure Window and replace the Noise wave with a Sawtooth wave. Disconnect the Pitch wires and move things over a little. We're going to add a Detune function next. 19. 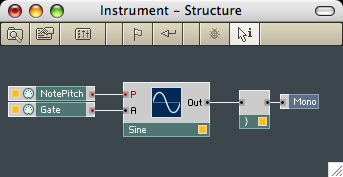 To Detune we'll need to use a Subtract function, which can be found at Built-In Module>Math>Subtract. The value to subtract will come from a fader (Built-In Module>Panel>Fader), which we'll label "Detune" and, using the Properties box again, adjust to a 37 pixel Small Horizontal Fader, deselect Value, select Hide Scale and then positioned below the Pulse Width Fader in the Instrument Panel. That's after you've moved Oscillator 2 from on top of Oscillator 1, of course. Finally, wire the output of the Subtract function into the Pitch inputs of the Oscillators. 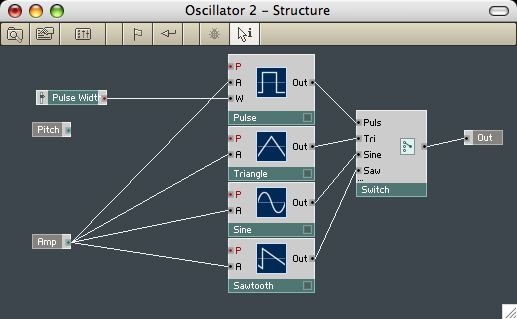 Oscillator2 is complete. 20. Back to the Instrument Structure now and we're going to add a Mixer so that we can balance the contributions of our two Oscillator Macros. For clarity and neatness we'll enclose the Mixer in a simple Macro. Firstly create a Macro>_New - 2in2out, delete one of the output ports and rename the other to "Out" as we did before. 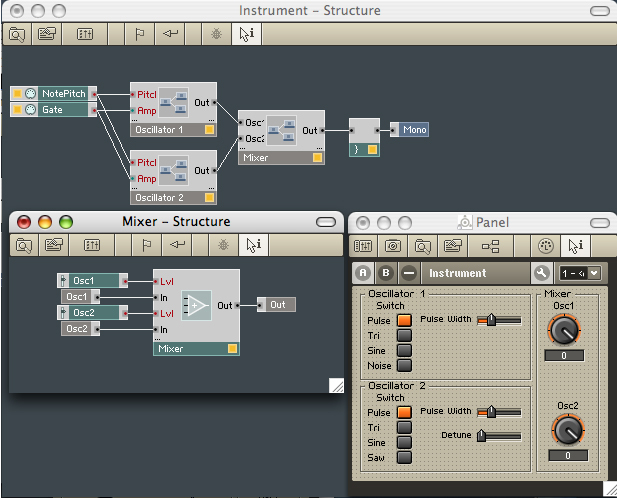 The two inputs can be named "Osc1" and "Osc2" and the Macro itself can be renamed "Mixer". Into the Macro's Structure insert Built-In Module>Signal Path>Amp/Mixer and use its Properties box to change MIN NUM PORT GROUPS to 2. Right click the Mixer's "Lvl" ports and Create Controls, which can be renamed "Osc1" and "Osc2". The Mixer's output needs to be wired to the Mixer Macro's Out port, the two Oscillators need to be wired into the Mixer Macro and the Mixer Macro's Output needs to be directed towards the Instrument's Audio Combiner (and thence Mono Output). Change the faders to knobs and tidy up the Instrument Panel to complete our two oscillator synthesiser. Don't worry, it will sound much better when we add an Envelope Generator to control the shape of the Volume (Amplitude).